Installed at the Center for Contemporary Arts, Santa Fe, NM in 2002. 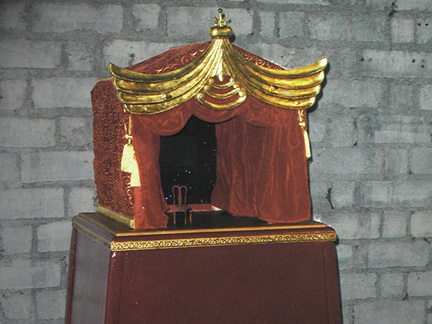 The movie plays on a small LCD screen set into the back of a handcrafted miniature stage. The theatre is 2 feet by 1.5 feet wide and tall. It sits on top of a custom made pedestal, with the screen just below eye level, encouraging the viewer to bend down and peer inside. A 360° QuickTimeVR movie of the theatre can be seen at VideoGraphicArts.com.